Ginger adds some heat to a Margarita. Photo courtesy Spice Market | New York. National Margarita Day is next week: Wednesday, February 22nd. There’s plenty of time to plan a Margarita party, mixing up some special recipes. You can also throw a “Presidents’ Margarita Party” over the holiday weekend. 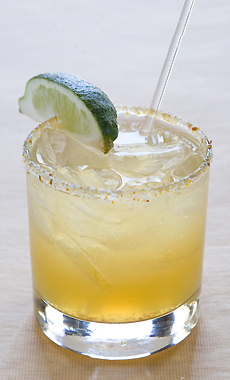 The original Margarita consisted of tequila, Cointreau (orange liqueur) and lime juice; but there have been many variations on the theme since then. Here’s one riff from Jean-Georges Vongerichten’s Spice Market New York restaurant. It fuses ginger, a spice from Southeast Asia, with the Mexican-origin cocktail. 1. Bring lime juice and sugar to a boil. Remove from heat and add ginger. Let steep until liquid is at room temperature. Strain through a chinois,* pushing the pestle or (other tool) for total extraction. 2. Combine all ingredients in rocks glass with ice. Shake vigorously. 3. Crust rim of glass with ginger salt (a combination of 1/4 part ginger powder, 3/4 part coarse salt) and pour Margarita into glass. Squeeze lime wedge then drop in drink. *A chinois is a cone-shaped mesh strainer. These days, they can be hard to fine. Instead, stores tend to carry what is known as a Chinese cap. It looks like a chinois, but instead of mesh, holes are punched in metal, like a colander. If you can find a mesh chinois, buy it: It’s finer and useful for all straining. The size of the holes in a Chinese cap can allow small particles, such as strawberry and raspberry seed, through.